PDF Masher is useful for remove and edit items like headers, footers, and irrelevant pages, remove selected text, change text title from PDF to make them easy to read on an eBook reader. Though many eBook readers don’t have PDF document optimization, it becomes frustrating to zoom in and out the page and then start reading the e-book, which is in some cases, doesn’t appear clear on the screen. 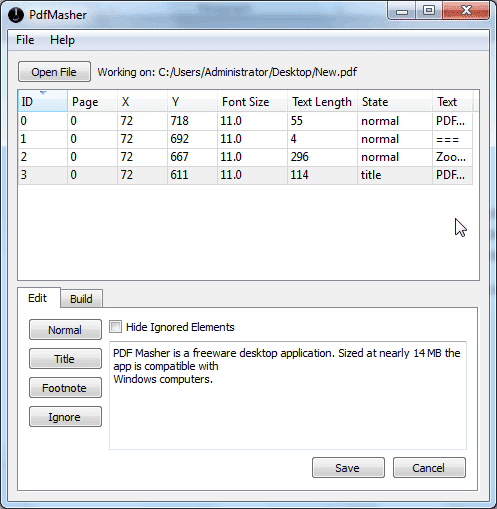 PDF Masher is a handy tool that transforms PDF document into HTML format. The column headers let you sort the PDF document by page, rows, columns, font size, text length, state, and document text. You can use these sorting options to quickly remove headers, footers, and useless text from the document. For instance, if you want to remove headers, all that is required is to click Y column to sort the headers. Now select all the headers and click Ignore. Make sure that Hide Ignored Elements option is enabled. Once you’re done with changing the document layout and editing document headers and footers, switch to the Build tab to finally view your edited document in default browser is an HTML page. It also offers some post processing features to reveal and edit the markdowns. After you’ve verified the PDF document in HTML format, you can export it to your e-book reader for distraction-free reading. It works on Windows.